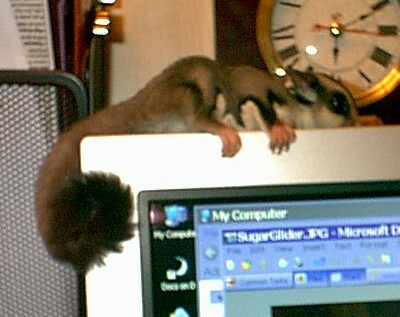 Wayne and I got our sugar gliders on the same day — the day before his birthday. His, Nimetz (aka "stinky") is an overly active — ok, HYPERACTIVE, little thing that dashes about like his tail is on fire. Mine, Trinity, is a doll. She’s calmer than Nimetz, and is MUCH quieter than Sheena (aka "Noisy"). She enjoys sitting on my desk, cuddled in her pink furry hat, while I work. She occasionally explores things on the desktop, or hops on my shoulder or even climbs my hair like a mountaineer attempting Mt. Everest — arriving safely on my crown before repelling back down to my shoulders. While active, she’s not spastic and seems to have warmed up to me immediately. Ok, I found what I want for Christmas. I just found out today that this would work with a Treo 650. I’d seen it before and thought it would be great for an Ipod or some such… but the stereo expansions for the Ipod have become pretty common. This is a portable stereo booster for the Treo 650! Awesome way to listen to my audiobooks and my music WITH someone else, without the tin-sound of a mono speaker. This weekend, when I blinked, all the leaves turned. I was watching them carefully. I knew that there would be a quick turn this year, I knew the colors wouldn’t last long — you can just tell these things — especially when many of the tree leaves go from green to brown and crispy in a matter of hours. But, we had a bit of chill in the air, and then the drizzle set in… and now everything is yellow and red and brown –and falling quickly. And as we go into the end of the year, I look around at my own stuff and feel a bit like a tree myself — like I need to be rid of stuff, like I need to shed a few layers of "things" that are clinging to me, weighting me down too. 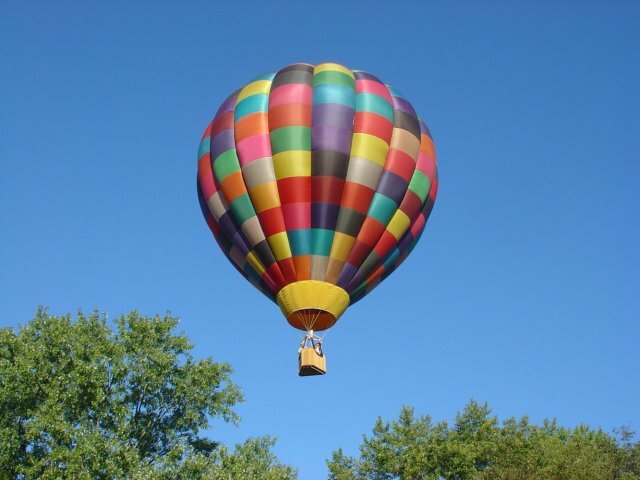 My best friend had a birthday surprise last weekend that included a ride in a hot-air balloon! Her date didn’t even tell her where they were going, but just whisked her away (to a height of around 7500 feet she tells me). I also goofed off a bit, but more importantly, I did some cleaning and organizing and I pulled together a box full of canned goods and non-perishables to send to the collection trucks stationed all over the local area for relief from Katrina down south.